In this second and last part of his feature about Maltese identity, Oliver Friggieri continues to interpret life on this small island through his own literary efforts. The inner aspect of the island resembles an unlocked mystery, whereas the outer one seems to exemplify just another segment of the complexity of the South. We are the southernmost part of the South and a methodic comparison with northern countries yields ample proof. Only regionalism (as opposed to continentalism) provides a complete definition of a country. Malta can be best understood through its belonging to a specific region, and that is definitive. We will always be Mediterranean. Characters in It-Tfal Jiġu bil-Vapuri and La Jibbnazza Niġi Lura are all, including victims, the product of a long, uninterrupted tradition, insular and self-sufficient, within which they recognise themselves. And so the long story goes... An unmarried mother, Susanna (Biblical connotation), a rigidly traditionalist father (Saverju, a typically Southern name) and an utterly submissive but patient mother (Katarina), a saintly priest whose holiness knows no bounds and is, therefore, equally saintly and self-destructive (Dun Grejbel, a name denoting the locally formed diminutive of ‘Gabriel’), and a distant, though vigilant, demanding, unanimous, crowd: perhaps these are the constituent elements of a conventional Southern European village, as typified in a local one. In such a remote corner, it-tarf tad-dinja (the edge of the world), all the predicaments of life are equally present: peace and disorder, love and hatred, life and death. Indeed, the village provides both the cradle and the tomb, birth and burial, and is therefore utterly complete, self-sufficient, in itself. A welfare state of fact, preceding the thought of it all. Indeed, the partial isolation of our foremothers/forefathers may have been a real privilege. I now do believe isolation may be a way of having the best of both words. Malta still stands that chance, but other choices seem to have naively taken over. A real pity for our future generations, who will have to decide whether living in Malta is viable or not. Either directly or in disguise, the question of ‘splendid isolation’ and dutiful integration has always been there. It has consistently been the real cause of the bittermost encounters (Strickland, Mintoff, the Church-State relationhip, the EU membership question, post-modernism, typified in the vivacious Lawrence Gonzi-Alfred Sant cultural conflict). But, to date never to disagreeable degrees. The Gonzi-Sant conflict, a generational duel, may be systematically analysed and defined, for instance, in terms of the adjectives they employ in the regard of each other and the semantic context within which such intentional adjectives are used. The exercise makes me very sad, and may I leave it at that. Indeed, a thoroughly cultural encounter. Maltese conflicts somehow reach a point and then come to a halt so as to calm down and lead back to normality. That is due to our long standing religious tradition, to which we owe also our complete social well-being. The Church-State dispute has normally illustrated this tendency. Life on an island must in any case look like a family event, an unpredict-able story in itself which must then have a happy ending. Celebrations of any sort are frequent, church village festi are a continuous occurrence, whereas politics is indeed an entertainingly controversial commitment to most inhabitants. Almost every argument has a partisan connotation. All words are inevitably loaded with unintended meaning. Most of our double or triple meaning is partisan. Meaning Added Tax. Nothing in Malta is politically free. Political correctness here means political belonging. All else is either myth or death. Sad enough, but then sufficiently pleasant to narrate, to translate into a novel. When all these ingredients are put together, the product must be contextualised isolation, a condition which is neither inferior nor superior to any other, but just different. It is intriguing to think that there may be only two spaces: ta’ Malta (inside Malta) and ta’ barra (outsiders). I and the other. But in actual fact it is a state of the mind, possibly everywhere, and not just a geographical fact. In these novels I have sought to explain events and feelings through the sense of belonging, perhaps the one underlying all. The family, the parish, the district (conventionally known as either a city or a village or a suburb), the parish, etc. are aspects of how belonging is organised, structured, transformed into conviviality. In the light of a whole spate of unwritten rules, such characters constitute a sort of autonomous state long before political awareness reached that stage. Malta lacked leaders of its own for a long time simply because it failed to look for them in the average person. A question of roots, unacknowledged, even despised. Independence is essentially mental, not constitutional. The Maltese are quite proud of their identity and therefore they will not find it very difficult to recognise the more important truth that their party only constitutes a half, and that the sense of incompleteness must be overcome. There they are: partisan in all respects, duly critical of the opposing party, and yet ready to acknowledge that they are all survivors. Otherness, as represented by the opposite group, is necessary for the islander to be sure of his/her completeness. Otherness is not what it is in a different context, namely where the sea is not so close and does not constitute a definitive boundary. Opposites imply and resemble each other. Hence, the islander is tied to the sea as much as to the fields. I have tried to explore this dichotomy in the novel La Jibbnazza Niġi Lura, where a large segment of the story occurs in the Grand Harbour area, the fanciful place of decades ago, the joy of my generation. Detailed descriptions and colourful memories help to recall and to revive the splendour of Harbour life any time of the day, any day. One only closes one’s eyes to see better, through memory, the earliest, the most recent candid camera. I firmly conclude that a large portion of the creative act is made up of nostalgia, an undefinable feeling pervading all senses. Thank God for nostalgia, especially now when now-ness is almost all. That environment is perhaps the most solemn aspect of the land-sea contact and of what makes islanders what they are: people related to the ocean, always aware of its call. Vapuri used to bring babies as much as they will always carry adults to other countries. Birth and departure are both a vapuri affair. The islander, therefore, is anybody anywhere. An island lives within the self as well. Let us concede that this, our, story is a tale about self-contentment. 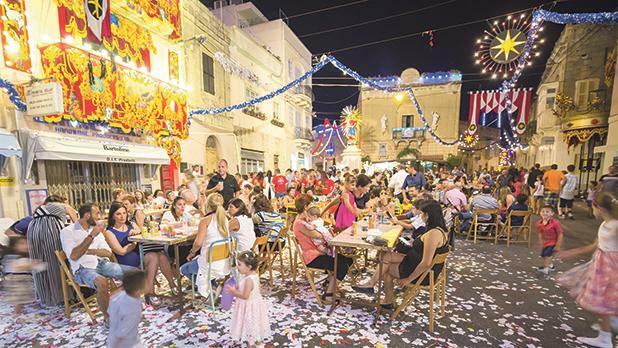 In the context of other countries, Malta’s story has been a story of success. In other terms, unequivocal, relative isolation has been a privilege. There enters pride, in disguise, inhibited and real. Much of the pride of the Maltese is derived from their profound attachment to the land and from the fact that they have an ancient language, rich, resourceful, recognised by so many remarkable foreign scholars as uniquely interesting for its intercontinentality, intimately related to the world’s three major religions. Maltese is simply close to the sounds God Himself has chosen to speak to this planet. So much pride condensed within a language. In spite of our low national self-esteem, we know that Maltese is simply very close to the medium chosen by God to disclose his plans to humankind, namely to the language of the Torah, the Gospels, the Quran. The dignity of the Maltese language is simply superlative. Therefore, the characters of a novel must naturally, albeit subconsciously, embody this feeling, this sense of security. As usual, it is all due to the most privileged aspect of our identity, faith. The Church can save whatever is still there to be saved of a whole tradition, or else it will perish like all perishables. A Church at the cross roads. The choice is hers to make, here and now. Another stage in the process of modernised isolation is normalisation. That only involves the adoption of international criteria. The fact that the Maltese tend to be automatically divisive on most issues is only indicative of their need to discover otherness. They are aware that the ocean is a ‘wall’, and that the land is a sort of open harbour, embracing water on all sides. The fortress image which Malta had for so long has been assimilated as part of the people’s mental apparatus. Our collective unconscious is that of a sailor, retired, remindful, nostalgic. At least, this is what I had in mind when constructing La Jibbnazza Niġi Lura, where the Grand Harbour area is thoroughly described and explored in its varied features. There is a ‘bambott’ (bum boat) willing to become a ‘gadraj’ (ship’s chandler), and there are all the nuances of an alluring environment which I very well remember and have sought to reconstruct in great detail. That stretch of sea between Valletta and Floriana, on one side, and Kottonera, on the other, typifies the condition of the rest of the island. The island’s real story cannot be understood if not against the Grand Harbour’s background. At least this is how I concluded that a Maltese story could actually resemble the story of any islander anywhere else. Delete any reference to Malta, and it will still be anywhere else. So is life, just one. 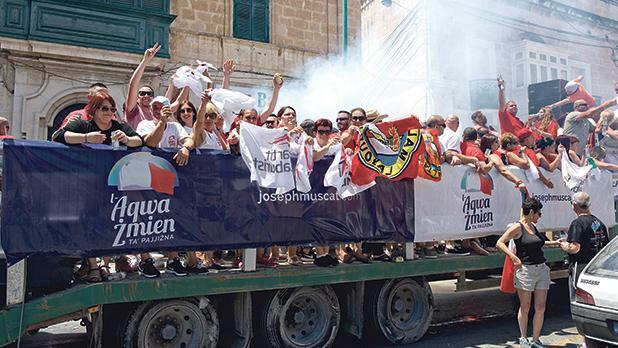 The protagonist of Fil-Parlament ma Jikbrux Fjuri, ironically named Karlu Manju, considers himself a full person, an example of unified duality, embodying the completeness and self-sufficiency of the emerging Maltese citizen. But even this is partly elusive, since things, ideas and people in Malta must be conceived in terms of to whom they belong. Such an illusion is necessary, a sign of the times, indicating an urge which is fast gaining ground among the younger generation, even though the traditional structure will still be there for a long time to come. There came the need, throughout the 20th century, for Malta to rediscover itself, to evaluate its heritage and to present it to the outer world. The fact that such an island has built itself into a state is indicative of the great amount of self-confidence the inhabitants have always had in their homeland and in themselves. Malta still a colony? To a great extent, yes. The irony of it all is that neo-colonialism is frequently identified with modernism, whereas references to other countries prove otherwise. But the process is still reversible, and the solution depends on how much an inverted sense of isolation can be overcome. Only international criteria favour our redemption from our own outdated colonial feeling. The territory, as well as the mental frame, are closely related to each other in the average life of an islander, especially so when the island is very tiny. Tourism has turned self-recognition into an economic necessity. As this industry assumes greater importance, it becomes more obvious that an island can only survive through going on being itself: its future somehow resides in its past. Narrating all this and much more in poetry and in novels has proved to me quite an inspiring experience, a sort of duty towards that unknown compartment of our psyche which still has to discuss itself in the light of both tradition and modernity. The two have to go on hand in hand, embodying continuity. Without its past, well preserved, venerated, Malta will not enjoy any future at all. Indeed, Malta can disappear and become an average residential area. The Maltese character must express this compromise between what appear to be extremes. The Phoenicians, the Carthaginians, the Romans, the Arabs, the British, have all contributed towards the formation of modern man. Perhaps a novel is the best medium for putting all this into meaningful shape. What will the Maltese now do of their own country? The attainment of independence and the self-proclamation of Malta as a republic are the results of a whole process. So, finally, the small community was in a position to decide for itself. It had been a long and weary way, during which culture was enriched and morale wandered through varying degrees. Polarisation has very deep roots. The overwhelming dualism may be looked at as a set of variations on a theme: the ruler and the ruled, the land (stability) and the sea (fluctuation), the enormous outer world and the minute inner territory, ancient tradition (defined, static) and modernity (speedy, relentless), continuity and mobility, the regional and the continental aspect. The list may go on and on, but perhaps it will only prove the same point: islanders descend from fish. But then, according to Einstein, what does a fish know about the ocean it swims in? Malta, the Southernmost part of the South (about 100 kilometres south of Sicily), an epitome of Mediterranean culture, a point of reference to the whole history of the region, the abode of a well-meaning people always ready to know itself better and to welcome visitors: this is perhaps the best way how to cut a very long story short. It has a happy ending. One hopes that Malta will eventually inspire Brussels to adopt a specific policy involving member states which constitute a category determined by size and regionality. But then that is another matter and will warrant a different sort of novel. Perhaps a novel about absorption. The plea of the islander within, the claim of any island, any place on earth where humankind asks what and why, et cetera. Oliver Friggieri was born in Floriana in 1947. Many of his books have been translated into various languages, including English, French, Italian, Romanian, Slovene, Hungarian. He addressed about 70 international congresses in various countries, and his poetry was included in some of the major poetry recitals held throughout Europe. Author of numerous books of poetry, criticism, novels, short stories, about 30 of which have been published in various countries. Author of numerous scholarly articles published in many international academic journals. Winner of local and international prizes, including Premio Mediterraneo Internazionale (Palermo, 1988), Malta Government Literary Award (1988, 1996, 1997), Premio Faber 2004 (Campidoglio, Roma). Professor of Literature at the University of Malta. He writes in Maltese, English and Italian.